Flora3d is utility for artists, game designers and 3D-modellers.The main function of Flora3d is generation of 3d-models of plants. Models can be saved in standard formats (*.3ds; *.x) or as a module Delphi (*.pas). First of all tree mesh is specially optimized for game scenes and for real time rendering. You can adjust the geometry and the number of polygons, and save it as different LOD. Flora3d does not generate extra vertices and planes so the file sizes get quite small. If you save a model as a *.PAS module you can select the primitive format from triangle array, quad array or strip array. You can adjust the geometry and the number of polygons, and save as different LOD. 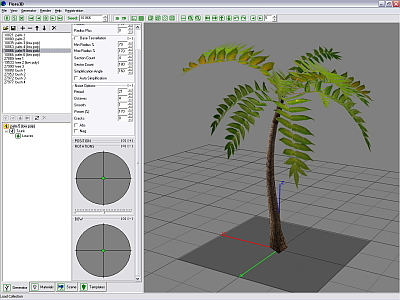 You can free download Flora3d and test the program. Saving options become available after registration. Qweas is providing links to Flora3d 2011.09.06 as a courtesy, and makes no representations regarding Flora3d or any other applications or any information related thereto. Any questions, complaints or claims regarding this application Flora3d 2011.09.06 must be directed to the appropriate software vendor. You may click the publisher link of Flora3d on the top of this page to get more details about the vendor.